The Bethany Labyrinth at St. Elisabeth’s is a 44-foot wide outdoor garden labyrinth completed in 2002. The entrance to our Labyrinth. Open to the public, every day of the year from dawn to dusk. 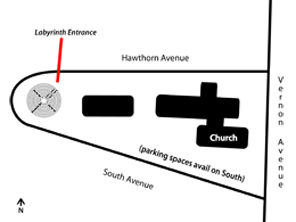 The Bethany Labyrinth is meant by St. Elisabeth’s to be a gift for the use of the wider community. Individuals or groups are welcome to use it. Sheets with information about labyrinths and how people use them are available in the wood box at the entrance to the labyrinth. If you have any questions, please call the Parish Office – or stop by during office hours. Follow directions to the Church as you normally would. St. Elisabeth’s is on a triangular shaped property – bordered by Vernon on the Eastern Side (closer to Green Bay Road), Hawthorn on the North, and South Ave – well, to the South! The Labyrinth is at the “tip” of this triangle where Hawthorn and South Avenues meet on the Western most edge of our campus. 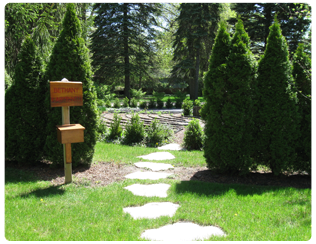 The entrance to the Labyrinth is on Hawthorn – look for the wood sign-post and box, please take an information sheet about labyrinths and walking them when you are there.